Our Lamb Meal & Potato recipe is advanced, grain-free nutrition for dogs who deserve only the best. Sourced from trusted, passionate farmers, our premium ingredients provide all the vitamins, protein and antioxidants your dog needs to thrive. Lamb Meal & Potato Recipe Dog Food is rated 4.7 out of 5 by 36. Rated 5 out of 5 by Debbi from EXCELLENT for Sensitive Stomachs I have been looking for almost 2 years now for a dog food that my one dog with chronic ulcerative colitis can tolerate and my other dog will like the taste of. I FOUND IT! We have been buying this for about 2 months now problem free :) I have tried probably 95% of all dry dog foods out there. I did find one wonderful product made with rabbit but the no longer make it. I was desperate to find anything she would tolerate and am so happy to have found this product. She is allergic to chicken and if you read the ingredients almost every product no matter what they say on the front has a high amount of chicken meal in it. I hope this stays around for a long, long, time. Rated 5 out of 5 by Rowdy from No more itching:) We started buying grain free about 6 months ago. We were not sure if our dogs had grain allergies. They scratched all of the time and were loosing fur. Now we have itch free pets and all of their for has grown back. They love the food and the treats. Our vet was very impressed of the all the great results. I will never buy another product, our dogs are people too, and only the best for them. Thanks Supreme Source. Rated 5 out of 5 by Chevygirl469 from Happy, healthy dogs! My bulldogs love this food and thrive on it! I have done a lot of research on dog food, this is a quality product with a great price! Highly recommended! Rated 5 out of 5 by Mary from 4 Happy and healthy dogs says it all Decided to try Supreme Source after it caught my eye at the local grocery store. One of my dogs has been on a limited ingredient diet from day one. He is just so darn sensitive to everything. Not only did he immediately take to the Lamb and Potato, he is thriving on it ! All 4 of my dogs are now on this product. It completely exceeded my expectations, no more of that expensive designer brand for my pack. Supreme Source grain free dry food stood up measure for measure and won ! Excellent source of protein, you won't be disappointed. Rated 5 out of 5 by AnneClair44 from Great Food ! Great Ingredients ! I was a devoted Purina pet food buyer for years. Purina changed the ingredients of their gain free brands and made the kibble much larger. I was having problems with the kibble size because I have a large Lab and a smooth Collie. I needed a dog food that was grain fee with small kibble. When I started buying Lamb Meal and Potato both dogs LOVED the the flavor and the size of kibble was perfect for both mouth sizes. The finicky Collie cleans his bowl !!!!! WIN WIN for Me ! I recommend all flavors of food. This is a brand I can trust and I see the results in my dogs ! Rated 5 out of 5 by Evp5 from My Dog Finished His Bowl! I had previously purchased Supreme Source Lamb Meal and Potato Recipe for my large dog because I was concerned that he was not getting enough protein or the most nutrition from other brands of dog food; with no exceptions my dog would never finish his serving in one sitting. After trying Supreme Source Lamb and Potato I no longer have concerns about his diet AND he leaves nothing in his dish! Even friends and family who knew of my dog's finicky eating habit exclaimed surprise and curiousity! Now they feed their not-so-little ones Supreme Source! If you have a dog and worry that their dietary needs are not being met you have to try Supreme Source for yourself! Your fur baby will be better for it! I know, as I'm now on my way to grab another package! Lamb Meal, Peas, Lentils, Potatoes, Poultry Fat (Preserved with Mixed Tocopherols), Tomato Pomace, Natural Flavor, Salmon Oil (Preserved with Mixed Tocopherols), Organic Dried Seaweed Meal (Ascophyllum nodosum), Salt, Taurine, Betaine, Calcium Carbonate, Choline Chloride, Carrots, Blueberries, Cranberries, Spinach, Parsley, Pomegranates, Vitamin E Supplement, Zinc Oxide, DL-Methionine, Zinc Proteinate, Ferrous Sulfate, Manganous Oxide, Vitamin A Supplement, d-Calcium Pantothenate, Copper Sulfate, Manganese Proteinate, Niacin Supplement, Riboflavin Supplement, Calcium Iodate, Thiamine Mononitrate, Pyridoxine Hydrochloride, Copper Proteinate, Vitamin D3 Supplement, Folic Acid, Sodium Selenite, Biotin, Vitamin B12 Supplement, Cobalt Carbonate, Rosemary Extract. 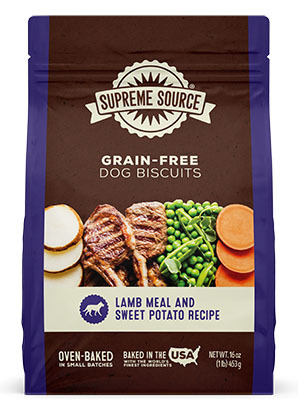 Supreme Source® Grain-Free Lamb Meal and Potato Recipe Dog Food is formulated to meet the nutritional levels established by the AAFCO Dog Food Nutrient Profiles for All Life Stages, except for growth of large size dogs (70 lbs. or more as an adult). Omega-3 Fatty Acids 0.2% Min. Omega-6 Fatty Acids 1.1% Min. CALCULATED CALORIE CONTENT (ME): 3,350 kcal/kg., 342 kcal/cup.